Alice Lake: Alice Lake is located 40 kilometres (25 miles) south of Port Hardy on the Port Alice Road. Rainbow and cutthroat trout, Dolly Varden, kokanee and coho salmon are abundant at Alice Lake. Anutz Lake: The lake is located at the southern end of Nimpkish Lake. Access is found via secondary road 48 km (30 miles) south of Port McNeill. Rainbow trout is the most abundant game fish in Anutz Lake. Atluck Lake: The lake is located 50 km (31 miles) south of Port McNeill via the Atluck logging mainline off of the main road to Zeballos. Rainbow Trout at Atluck Lake are the game fish. Brannen Lake: 10 km (6 mi) northwest of Nanaimo city centre. Follow Metral Drive to Godfrey Road and posted signs to the lake. The stocking of cutthroat and rainbow provide good fishing for species of up to 5 lbs at Brannen Lake. Kokanee are resident in the lake. Buttle Lake: The lake is located in Strathcona Provincial Park and is accessed from Highway 28 to Gold River and from the south arm of Upper Campbell Lake. The best months to fish the lake are April-June and September-October. Rainbow and cutthroat trout, although small, are abundant in Buttle Lake. Crabapple Lake: The lake is located 13 km (8 mi) northeast of Sooke town centre via Harbourview Road to a secondary logging road. Crabapple Lake provides excellent fly fishing for both rainbow and cutthroat trout. Crystal Lake: Located 8 km (5 mi) west of the Island Highway. Access is via Spurston Road and 1.6 km (1 mi) of logging road. Cutthroat trout is stocked in the lake. Anglers report Crystal to be an excellent fly fishing area particularily during March-June and September October at Crystal Lake. Doran Lake: The lake is located 40 km (25 mi) west of Port Alberni via Hwy #4 to a small logging road just past the west end of Sproat Lake. The best fishing occurs in June and September-October. Doran Lake was stocked with steelhead fry. Dougan Lake: Located beside and to the west of the Island Highway north of the traffic lights at the Cobble Hill turn-off. Dougan Lake provides an excellent fishery for both cutthroat and rainbow trout which are stocked regularly. March-June and September-October are the most productive fishing months. Echo Lake: Echo Lake is located 20 km (12.5 miles) southwest of Campbell River via Highway 28 to Gold River. Cutthroat and rainbow trout are abundant and rainbows are stocked at Echo Lake. Fairy Lake: Located near Port Renfrew, 65 km (40 mi) west of Mill Bay via logging road from either Lake Cowichan or Port Renfrew. Fairy Lake provides good fishing for Dolly Varden char, resident and searun cutthroat trout particularily during May-June and September-October. Farewell Lake: The lake is accessible via the Menzies and Long Lake logging mainlines which connect to the Blackwater Lake Road. Farewell is approximately 40 km (25 m) northwest of Campbell River. Cutthroat and Kokanee are the game fish in Farewell Lake. 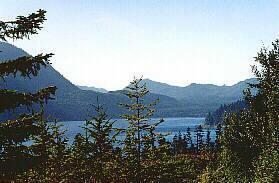 Flora Lake: 55 km (34 mi) southwest of Port Alberni via Franklin, South Main and Flora Lake logging roads. The best fishing occurs during May-June and September-October. Rainbow trout are stocked at Flora Lake. Georgie Lake: This lake is located approximately 10 km (6 miles) northwest of Port Hardy off of the Holberg Road. The Georgie Lake area is home to some of the islands finest cutthroat fishing. Rainbow trout have been reported although they are not abundant. Gosling Lake: Gosling Lake is located 20 km (12 m.) west of Campbell River via either the Brewster Lake Road, Campbell Lake Road or Boot East Road. Fishing for the abundant cutthroat trout will prove the most productive during April-June and September-October at Gosling Lake. Gracie Lake: A short hike in lake located 20 km (12.5 mi) west of Port Alberni via Hwy #4 and the Stirling Arm logging mainline to Nahmint Lake. The best fishing occurs during May-June and September-October. Gracie Lake is renowned for its excellent rainbow fishing. Healy Lake (Panther Lake): The lake is located 37 km (24 mi) west of Nanaimo via the Nanaimo Lakes Road to the Branch C logging road. Healy Lake is a small fly only lake contains rainbow trout. Fishing is good all summer with peak months being May-June and September-October. Henry Lake: This small sub-alpine lake is located 26 km (16 mi) southeast of Port Alberni via Hwy #4 to the Cameron logging mainline and a series of secondary logging roads. Henry Lake was stocked with steelhead. Holden Lake: Located 5 km (3 mi) southeast of Cedar in the Yellow Point area via Cedar Road to Hemer Provincial Park. Anglers find Holden Lake productive for cutthroat trout and smallmouth bass year round, with peak months being April-June and September-October. Horne Lake: Horne Lake is located 18 km (11 mi) west of Qualicum Beach community via Hwy #4 and Horne Lake Road. Horne Lake was stocked with steelhead and cutthroat trout. Kokanee and rainbow trout are resident and not uncommon. Keogh Lake: The lake is located 11 km (7 miles) southwest of Port McNeill via a logging road or directly off of Hwy #19. The spring and fall months are the best for rainbow and cutthroat trout, Dolly Varden and springs. Keogh Lake provides shore angling oppurtunities. Klaklakama & Little Klaklakama Lakes: These lakes are located 75 km (47 miles) southeast of Port McNeill and 15 km (9.5 km) east of Woss via a logging road south off of Hwy #19. The lakes contain both cutthroat trout and Dolly Varden. Klaklakama Lake was stocked with cutthroat trout. Lower Campbell Lake: The lake is located 11 km (7 mi) northwest of Campbell River via Hwy #28. Year round fishing is possible but the best time is during April-June and September-October. Dolly Varden, rainbow and cuttroat trout are resident in the lake. Lowry Lake: Access to the lake is located 30 km (19 mi) northwest of Port Alberni on Hwy #4 via Great Central Lake Road, the Ash River logging mainline or the road to Thunder Mountain. Lowry Lake provides good fly-fishing for cutthroat and rainbow trout. Kokanee are also resident in the lake. St. Mary Lake: St. Mary Lake is located on Saltspring Island. Regular ferry service to the island is available from Vancouver Island. The lake is found 3.5 km (2 mi) north of Ganges. Due to the large amount of stocking of a variety of species, St. Mary Lake provides excellent opportunity for the avid angler. Smallmouth bass of record sizes (8 lb) are resident in the lake. Matheson Lake: Located within Matheson Lake Regional Park which is 27 km (17 mi) southwest of Victoria by way of Rocky Point Road. Matheson Lake provides excellent fishery for smallmouth bass, cutthroat and rainbow trout. McCreight Lake: McCreight Lake is located 63 km (39 mi) northwest of Campbell River via 4 km (2.5 mi) of the gravel Rock Bay Road off of Hwy #19. McCreight Lake was stocked with cutthroat and rainbow trout. Dolly Varden char are resident. McKay Lake: McKay Lake is located 16 km (10 mi) north of Ladysmith via the Island Highway to Spurston Road, at the end of which the lake is found. McKay Lake is stocked with cutthroat. The best fishing is reported during March-May and October-November. Moat Lake: The lake is located in Strathcona Park and is accessed from the Forbidden Plateau/Mt. Washington ski areas by marked hiking trails. The peak fishing period at Moat Lake is from July to September when anglers can expect to catch good sized rainbow trout which are stocked. Muchalat Lake: Muchalat Lake is located 19 km (11.72 mi) from Gold River. The access road is off of the road from Gold River to Woss. Dolly Varden char, kokanee, cutthroat and rainbow trout are resident in Muchalat Lake. Prospect Lake: 18 km (11 mi) northwest of Victoria via West Saanich and Prospect Lake roads. Prospect Lake is stocked with rainbow and cutthroat trout and provides good smallmouth bass fishery. Quamichan Lake: Located 3.2 km (2 mi) east of Duncan via Trunk and Indian roads. Quamichan Lake provides excellent fishery for stocked rainbow and cutthroat trout as well as brown bullheads (catfish). Cutthroat are reported to sizes of up to 5 lbs. March-June and September-October are particularily good months for anglers to try their luck. Quinsam Lake: The lake is located 19 km (12 mi) southwest of Campbell River via the Duncan Bay logging mainline. The best months for fishing are April-June and September-October when rainbow and cutthroat trout are abundant in Quinsam Lake. Rooney Lake: Rooney Lake is located 28 km (17.4 mi) west of Sayward. The lake may be accessed by either a short logging road to the campsite on the north shore of the lake or directly from Hwy #19. This small lake was stocked with cutthroat trout and provides an excellent fishery for both the cutthroat and Dolly Varden char. Silver Lake: 32 km (20 mi) west of the Island Highway off of the Chemainus River Road via Branch 1 off of the logging mainline. Rainbow trout are the game fish in Silver Lake. Snakehead Lake: Access to the lake is a short hike from a picnic area off of Hwy #28, approximately 30 km (18.6 mi) southwest of Campbell River. The best fishing for the abundant cutthroat trout is during April-June and September-October at Snakehead Lake. Spectacle Lake: This small lake is located 30 km (19 mi) northwest of Victoria near the Shawnigan Lake turnoff from the Island Hwy. Spectacle Lake holds the islands only eastern brook trout population. This species is a member of the char family. During spawning the brook trout turns a brilliant colour and is easily caught. Victoria Lake:Victoria Lake is located 60 kilometres (40 miles) southwest of Port Hardy. Large rainbow trout and cutthroat trout can be found here. Trolling with baitfish imitations will produce positive results. The best time of year to visit the lake is in the spring and fall. Willemar Lake: The lake is located 29 km (18 mi) southwest of Courtenay and is accessed by the Comox Lake logging mainline, past the south end of this lake. Rainbow, cutthroat (stocked), Dolly Varden and kokanee are abundant at Willemar Lake. Wolf Lake: The lake is located 16 km (10 mi) northwest of Courtenay and is accessed from the Duncan Bay logging mainline. Fishing at Wolf Lake is excellent during April-June and September-October. The lake is stocked with cutthroat trout.